I hope that you are all well and have escaped all the winter colds that seem to be going about. I managed to get home from work in daylight so Spring is not too far away. 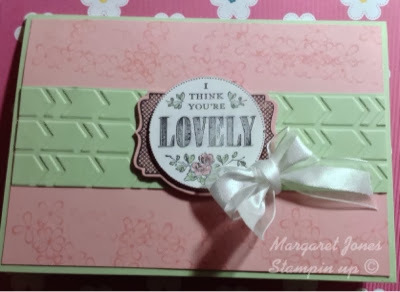 This card uses the lovely stampset apting named You're Lovely which is one of the free stamps available as part of Sale-a-bration which lasts until the end of March. To get this stampset free all you have to do is to make an order of £45 or more from the current catalogues. This order could come from an online order(see my shop logo in the right sidebar ) or by having a party or by purchasing items at one of my classes (see classes page for more details) . Please get in touch if you would like more details on any of these methods. I think your CARD is LOVELY! Lots of interest/detail with the floral stamped background and embossed panel. You are right, that sentiment is the BEST! and you've coloured it beautifully. I'm with you on the longer day-light hours...bring on Spring! Thanks for linking up with the Dynamic Duos this week. Oh my! This card is lovely! Love the focal point and emboessed center border! Thanks for joining the DD!